Melted cheese, savory tomato sauce, and rich meaty toppings – who can resist a slice of America’s favorite Italian street food? Out of all the fast food options available – I’ll be honest, pizza is not the worst, but it also isn’t necessary healthy. Depending on the fast food or restaurant chain, a slice can deliver anywhere from 180 to 500 calories, with plenty of fat and sodium layered on thick. 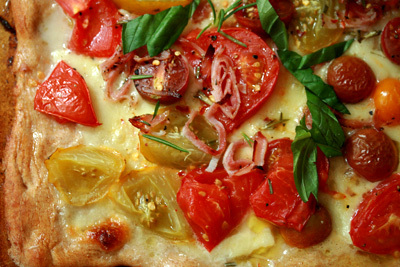 So here is the quick fix to making pizza healthy enough to enjoy every day. Want to feel fuller with just one slice of pizza? Start with a fiber-rich, whole grain crust that you can find in your local grocery store freezer. Or better yet, make a few batches of whole wheat pizza dough to keep in your freezer at home. Eating more whole grains helps to stabilize blood sugar levels while the white processed stuff leads to spikes and crashes in your energy levels. Your average jarred marinara sauces are low in calories but very high in sodium. All the building blocks of a standard pizza, from the crust to the cheese and meat toppings are high in sodium. Give your blood vessels a break and look for low-sodium jarred sauce or just drain a can of lower sodium whole peeled tomatoes to top your pizza instead of using sauce. Cheese and meat toppings can turn a healthy pizza-base into a fat bomb. To slimline your pie, start with part skim mozzarella. Out of all the lower fat cheese, it melts the best and looks just like the full fat version. Instead of adding pork sausage or beef pepperoni, go for sausage and meat toppings made from turkey and chicken. Even healthier types of sausages (that are lower in saturated fat) can still be very high in sodium, so use sparingly. Want to cut back on fat, but not on the size of your slice? Go nuts with the veggies. No need to precook peppers, mushrooms, arugula, and corn – they cook in the oven. Wilt spinach in a hot skillet for 30 seconds and lightly steam broccoli, they are two superfoods that can round out the nutrition in your pie.